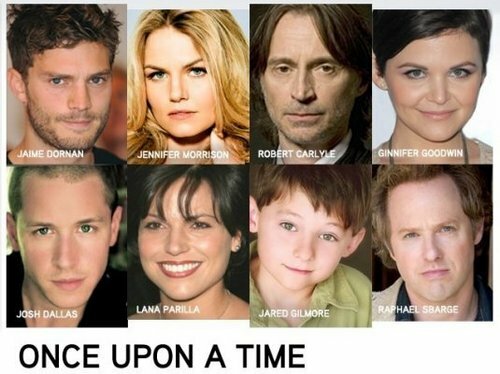 Once Upon A Time- Cast. . Wallpaper and background images in the once upon a time club tagged: jennifer morrison once upon a time 2011 set cast ginnifer goodwin. This once upon a time photo contains potret, headshot, and closeup. Edward Kitsis and Adam Horowitz (Lost, Tron) invite you to a bold new vision of the world where fairytales and the modern day are about to collide. Anna Swan (Jennifer Morrison) knows how to take care of herself. She's a 28-year-old bail bonds collector who's been on her own ever since she was abandoned as a baby. But when the son she gave up years ago finds her, everything will change. Henry (Jared Gilmore) is 10 years old now and in desperate need of Anna's help. Henry believes that Anna actually comes from an alternate world ... and is Prince Charming (Josh Dallas) and Snow White's (Ginnifer Goodwin) missing daughter. According to his book of fairytales, they sent her away to protect her from the Evil Queen's (Lana Parilla) curse, which trapped the fairytale world forever, frozen in time. Of course Anna doesn't believe a word, but when she brings Henry back to Storybrooke, she finds herself drawn to this unusual boy and his strange New England town. Concerned for Henry, she decides to stay for a while, but she soon suspects that Storybrooke is more than it seems. It's a place where magic has been forgotten, but is still powerfully close ... where fairytale characters are alive, even though they don't remember who they once were – including the Evil Queen who is now Henry's foster mother. The epic battle for the future of all worlds is beginning, but for good to win, Anna will have to accept her destiny and fight like hell. Brace yourself for a modern fable with thrilling twists and hints of darkness. Brimming with wonder, and filled with the magic of our most beloved fairytales, Once Upon A Time is a fitting follow up to Lost from two master storytellers.